MET Institute of Pharmacy (Degree) held Annual Convocation Ceremony on 03 March 2018 for the B. Pharm. batch 2013-17. The event began with the lighting of the lamp at the hands of Dr. U.B. Hadkar, Director – MET IOP, Dr. Abha Doshi, Principal, MET IOP (Degree), Dr. Anand Shedge, Director, MET Institute of Medical Sciences and Mrs. Priyanka Joshi Jain, Coordinator. The occasion was graced by the FDA Commissioner of Maharashtra, Dr. Pallavi Darade as the Guest of Honour. She addressed the students on career opportunities in pharmacy and encouraged them for their further pursuits. The graduates then pledged to serve the profession of pharmacy in an ethical manner. 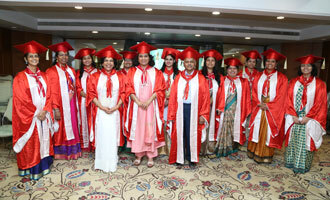 The degrees were then conferred upon them by the Director, Principal and the Guest of Honour. A photo session with the Graduating Batch was conducted and the ceremony concluded by interaction with the teachers over tea and snacks.